Serious winter weather is hitting several parts of the country this week, and while we’re certainly no haters of winter (we love it, actually! ), we can also sympathize with the momentum-zapping effects of sustained cold and gloomy weather. 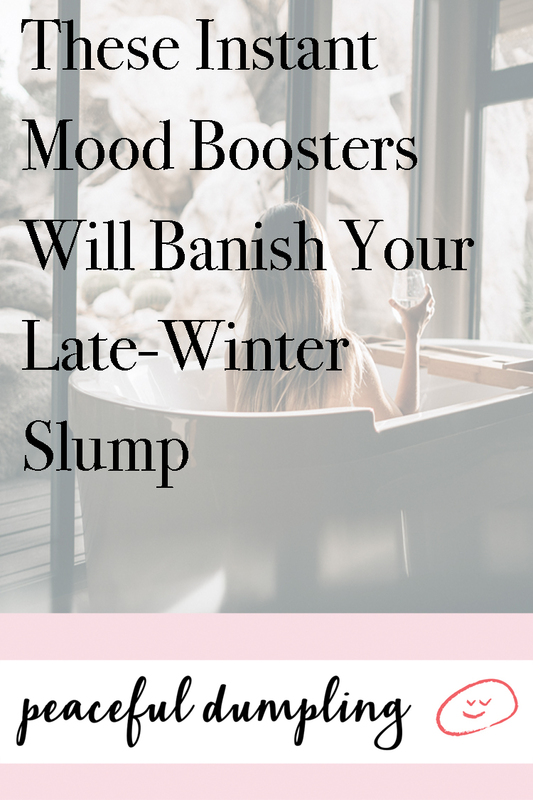 Whether you experience Seasonal Affective Disorder (SAD) or simply catch a case of the cold weather blahs towards the end of the season, there are several natural ways to ease the mild depression, anxiety, low self-esteem, and general “stuckness” that can make an unwelcome appearance after months of icy, dark weather. While taking a brisk walk outside, even if it’s overcast, is one of the best ways to cheer up (and get much-needed vitamin D), sometimes a winter storm is raging or it’s past daylight hours, and you’d like to feel better, like, now. The following are some of my favorite ways to instantly improve my mood (these methods actually work any time of year but are especially handy when the weather or time of day prevents me from going outside and getting proper fresh air and sunlight). These little rituals can be combined or tried on their own depending on your desires. While lavender and chamomile oils may be go-tos for relaxation and distressing, brightly scented citrus oils—like bergamot, sweet orange, lemon, and neroli—may help you feel more alert and energized (sans jitters). Invigorating scents like eucalyptus, spruce, and peppermint are excellent choices, too. Creating your own blends is a mood-boosting activity in itself! I admit I am a sucker for wellness lattes, tonics, juices, and the like. A wellness drink doesn’t have to be super fancy (in terms of $$$). Sometimes just a good quality cacao powder mixed with your favorite plant milk can feel quite pampering while offering nutrients and antioxidants. If you’re feeling creative and up for something more elaborate, give this beautifying blue collagen latte a whirl. Tip: If you find yourself feeling unmotivated in the morning, set out your favorite wellness ingredients the night before so everything is easier when you wake up. Alternatively, if you’re feeling anxious before bedtime, a caffeine-free wellness drink can help soothe your nerves. After the overstimulation that tends to accompany the holiday season, it’s so easy feel scattered and to find the months of January and February a bit lackluster. To refuel your inspiration and ground yourself, revisit your personal manifesto or write an updated version. Reminding yourself of what you’re all about can help you focus on the positive when you’re feeling a bit less than. When I feel stagnant—regardless of the time of year—I feel much better about having “accomplished” something when I sit down to make plans. Something as simple as filling out my planner for the following month also helps me feel more on top of things and less anxious about what’s on my plate. I also like to plan something with myself or a friend. For example, I’ll spend a few minutes planning a small project around the house (like reorganizing my closet), or I’ll text a friend and set up a coffee date—it feels good to have something concrete to look forward to! If you need to invite energy into your being, consider a faster paced vinyasa or cardio routine accompanied by Breath of Fire, which can help you feel refreshed, awakened, and lighter in your body. If the day has you feeling positively overstimulated and ragged, however, a quiet, slow routine may be more appropriate. Turn down the lights, mindfully unroll your mat, and focus on deep breath and intentional movement. Whichever style of exercise you choose, you’ll be boosting your circulation and giving your muscles TLC. It’s a win-win. Perhaps it’s just me, but sometimes winter weather has a way of brushing up against old wounds that possibly weren’t quite healed—or stirring up new anxieties and worries. Rather than finding an easy distraction, why not confront these head-on and write all of your thoughts down in a journal? This is the perfect time to silence your internal editor and allow yourself to get messy. Articulating your emotions can sometimes help them seem more navigable, and you may even feel “heard” even if you’re just sharing your secrets with the page. What are your favorite winter self-care rituals?